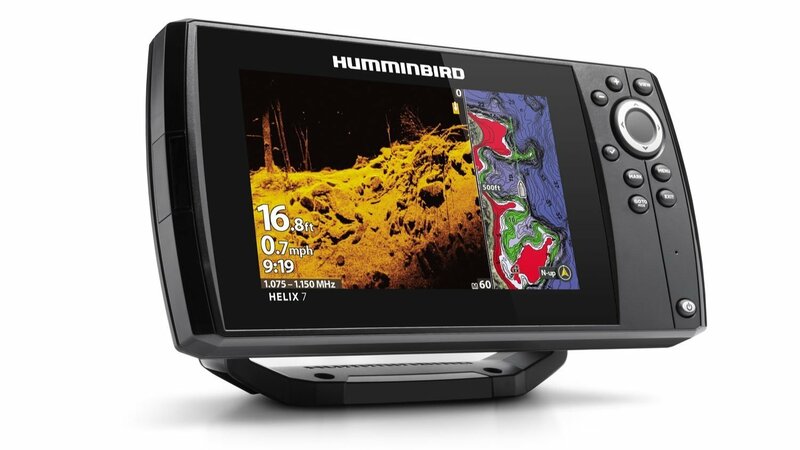 The ICE 688ci HD is the newest and best ice fish finder from Humminbird. The ICE 688ci HD Combo combines a high speed digital flasher with the 2D sonar, precision GPS, and Lakemaster mapping that you would find on a normal fish finder. Ice fishermen finally have the same technology at their fingertips that open water anglers do. In this review, you will understand the features available to you, and how you can use them to catch more fish this ice season. Screen: 5”, 640×640 HD Display, with high brightness for viewing on sunny days. Faster Processing compared to previous ICE models. Modes: Flasher mode, and Graphing mode to see jigging and fish movement history. Flasher has 3 color schemes to make locating weeds easier. Sonar: 200/83 kHz, DualBeam PLUS with SwitchFire. Transducer: XI 9 20 with float is included. Power: 4,000 Watts PTP, and 500 Watts RMS. Mapping: Built in BaseMap and compatible with Lakemaster or Navionics Gold SD cards. Include a Weatherproof carrying case with handle, and a 12V AGM Battery. 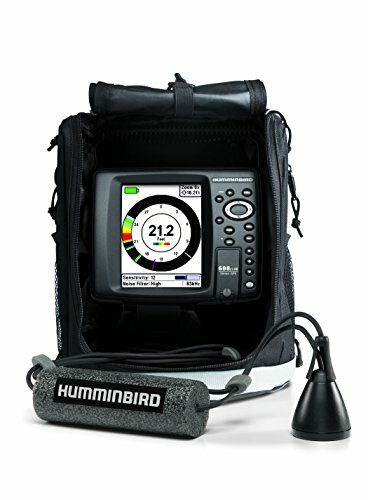 The ICE 688ci is a portable ice fish finder. All you have to do to set it up initially is to mount the battery to the carrying case, and connect the power and transducer cables using the cable collector. The XI 9 20 transducer comes with a foam float that you slide onto the cable, allowing you to submerge the transducer just below the ice to get a proper sonar reading without reducing the width of the sonar cone. Graphing mode is exactly the same as how you would use a fish finder on a boat, except the transducer is stationary, and you’ll be focusing on the depth of you jig and looking for fish to move within the sonar cone. To use the digital LCD flasher, you’ll need to activate Ice Fishing mode, which can be found in the Sonar tab of the Main Menu. This mode also displays your battery’s power level, sensitivity, sonar frequency, and noise filter settings. The ICE 688ci HD is a DualBeam PLUS fish finder, which means you can use the 200 and 83 kHz beams together, or individually, depending on how you want to fish. The wider 60 degree cone of the 83 kHz beam is better for when you are fishing in shallower water, usually 10 feet or less, and for when you have baits or jigs that tend to have more side to side movement. The 83 kHz setting provides the widest coverage area underneath your hole. Use the narrower 20 degree beam on the 200 kHz for depths over 10 feet, for vertical jigging, and for clear bottom readings and higher accuracy. Adjusting the sensitivity properly is critical to having success while ice fishing. Pressing the Menu button once will bring up the small Ice Fishing express menu where you can quickly adjust the sensitivity, range, and color palette to your liking. Adjust the sensitivity with the arrow keys until your jig is showing up with the weakest color returns. This way you can be confident that any fish larger than your bait will show up on your graph of flasher wheel. These steps are demonstrated in the video below. 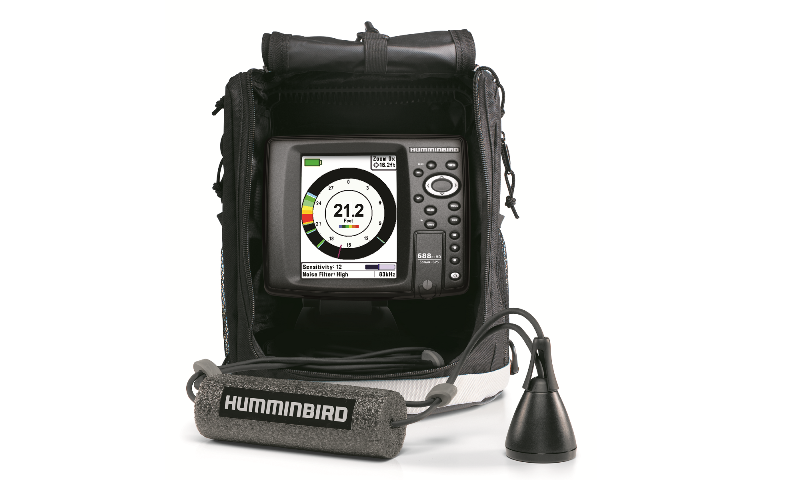 The mapping and charting capabilities of the Humminbird ICE 688ci HD Combo are what really set this unit apart from other ice fish finders. With the internal GPS receiver and SD card slot, you can upload and return to waypoints and fish holding structure that you’ve already located in past years and during open water season. You can also use the regular Lakemaster Chart SD cards to show highly detailed lake maps, and use them to put yourself over likely hotspots. There’s much less guessing when you have a built in GPS and Lakemaster mapping. 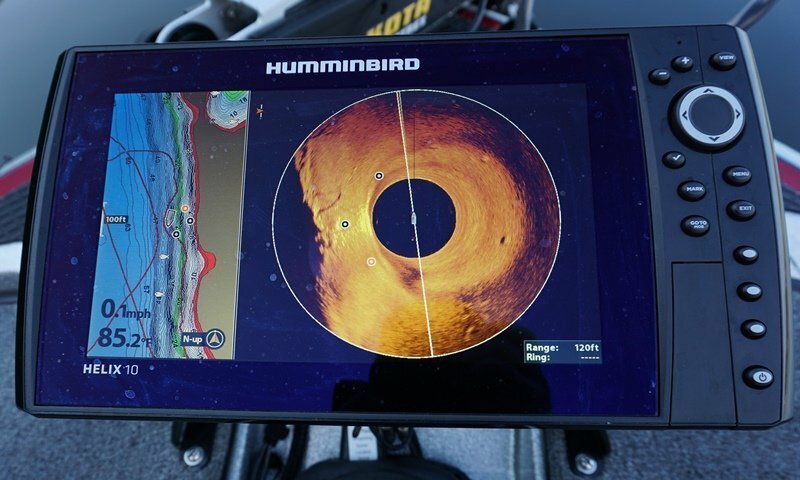 As with many other Humminbird products, the ICE 688ci is AutoChart compatible. This is an extremely powerful option for anglers. No longer do you have to deal with guessing on uncharted waters, you simply create custom maps during the open water season, and pop in the AutoChart Zero Line SD card to have fully detailed map of your lake. 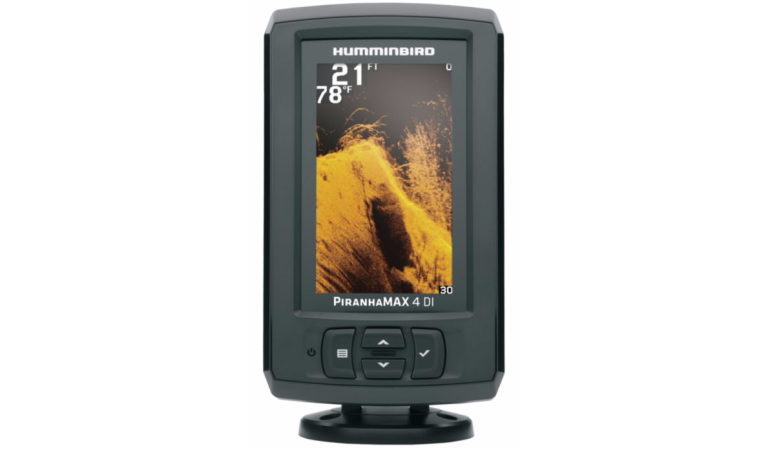 Pros >> Dual graphing and flasher modes, dual sonar frequencies, large and bright LCD screen. Cons >> Some users have experience slower than desired GPS fixes, typically seen on the first time powering on for the day. Bottom Line >> The GPS and Lakemaster/Navionics compatible mapping make this one of the most powerful and best ice fish finders for the money. The AutoChart capabilities are an added bonus to get even more from your fish finder.